On the Better Homes and Gardens website, I saw this pretty flower cup decoration. Basically it is just a mini cupcake wrapper inside a regular one, and then they are both placed in an egg cup. It is so simple, but yet very pretty for your Easter/Spring get togethers. 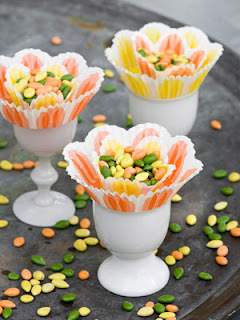 To read more about the Flower Easter cups and see other Easter decorting ideas, you can see them at bhg.com here.